Sorry Margaret, we don't yet have any mobile apps. But there is a mobile friendly version of the website. Is there an Android app for plotaroute? Must be me... Can't, for the life of me, get this to work on my iPad. When I click on the PLOT A ROUTE NOW button, I get a message box asking me to choose a map location. When I cancel that, I get the world map but no share button as described. Any suggestions? 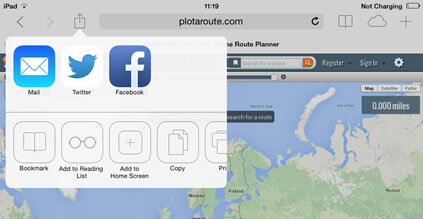 Go to www.plotaroute.com in Safari on your iPad. Click the PLOT A ROUTE N0W! button from the home page (no need to sign in). Tap on the Share button located at the top of the screen. Select Add to Home Screen and then Add. The following icon should be added to your Home Screen. Click the plotaroute icon when you want to launch the app and it will run as a full screen web app. NOTE: Be sure to use the iPad in landscape mode to see all the menu options.